Insomnia is a disorder characterized by having difficulty in sleeping. Other symptoms for this ailment include waking up in various moments during the night and being unable to slip back to slumber, waking up too early, and having feelings of fatigue upon waking. The typical treatment for insomnia is sleeping pills, but you may look into cannabidiol or CBD oil as a more natural alternative. Your endocannabinoid system or ECS consists of a network of receptor sites found on cell membranes all over the body like CB1 and CB2, chemical activators, and enzymes. In a well-functioning system, the chemical activators open or close the receptor sites and the enzymes either support the activators or break them down. This way, the body receives and translates the signals that it’s supposed to receive. However, in some individuals, there aren’t enough enzymes produced, or the activators aren’t able to communicate well with the receptor sites. This causes a multitude of health issues, one of which is insomnia. CBD from high-quality oil, like the products from https://trustedcbdoil.com/, interact with cannabinoid receptors named CB1 and CB2. CB1 – These receptors are mostly found in the central nervous system, particularly the brain and spinal cord, which controls the body’s core functions such as pain perception, motor activity, stress response, and memory. CB2 – These receptors are the ones found throughout the organs of the body like those found in the immune system, muscular system, and cardiovascular system. Since CBD interacts with CB1 and CB2 receptors, the potent chemical can reduce feelings of stress and anxiety which are the leading causes of insomnia. Significant life stress such as the death of someone you love or job loss plays a major role in acute insomnia while chronic insomnia is caused by depression and anxiety. Recent studies have proven the health benefits that CBD has in alleviating pain and anxiety. The chemical compound lowers your blood pressure; thus, reducing feelings of adrenalin that your body may associate with danger. Moreover, it also activates the 5-HT1A or hydroxytryptamine serotonin receptor, which leads to an anti-anxiety, relaxing effect. While more studies are being conducted to support the evidence of CBD as a potent cure for insomnia, you shouldn’t worry about being drowsy when using it during the day. It does not operate like a sedative. Instead, it combats the probable causes of your insomnia like chemical imbalance and, as mentioned above, stress. It’s calming and stress-relieving properties allow you to relax even before your head hits the pillows. Rapid eye movement or REM sleep is the last phase of the sleep cycle. People pass through this stage at frequent times during the night. It is known as the dreaming stage. One study found that CBD may have therapeutic potential as a treatment for sleeping disorders, particularly insomnia. Non-REM or NREM Stage 1 – Slow eye movements characterize this stage. If you’re still in this phase, your sleep can easily be disrupted. NREM Stage 2 – Light sounds no longer wake people in this sleep stage. Your brain waves proceed to slow down as well as your heart rate. Body temperature also decreases here. NREM Stage 3 – This is described as the restorative stage of sleep. Waking someone up in this stage of sleep can be a challenge. REM Stage – Here is when you have rapid, side-to-side eye movements. It is also the stage where brain waves are more active as compared to the previous phases. Sleep disturbances in insomniacs frequently occur in this stage. 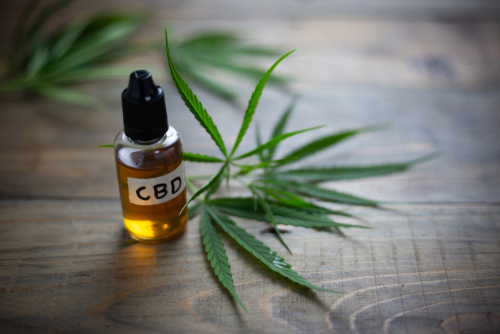 While a majority of people find that CBD helps them sleep better and gives them a relaxing feeling, your body may have a different reaction from the plant-derived chemical compound. Some individuals reported feeling energized after taking the oil. There are those who also experienced adverse side effects such as nausea, vomiting, or diarrhea. Just make sure that you talk with your doctor on whether CBD oil is a viable treatment option. There isn’t enough scientific data yet to cement CBD’s status as a natural treatment for sleep-related problems. However, don’t discount the favorable effects that several people gained from trying out this alternative. Everybody has a different way of processing this chemical compound, so always proceed with caution when trying out new products.